The event kicks-off with a dinner Wednesday evening and wraps- up with a dinner on Thursday night. Among our confirmed speakers: Bret Stephens, Allen West, David Goldman, Ralph Peters, Erick Stakelbeck, Robert Spencer, Daniel Pipes, Andrew McCarthy, and David Horowitz. We will be confirming more speakers in the coming days. 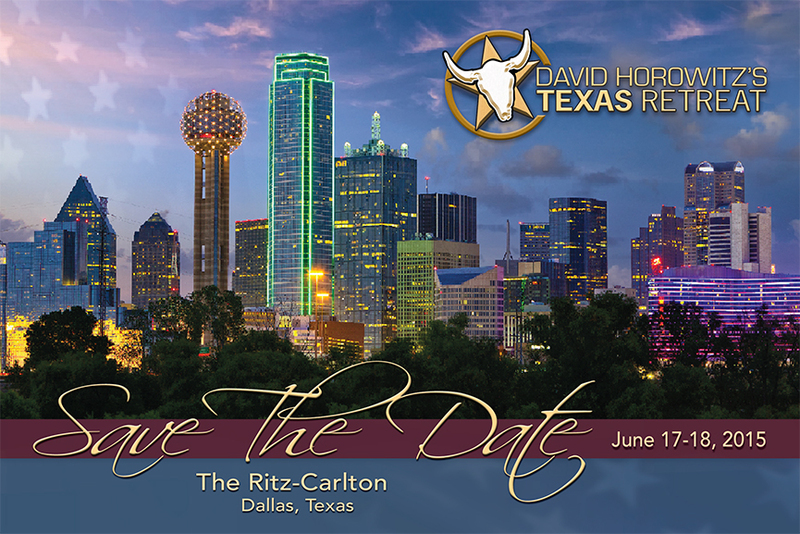 You can make a reservation at the special conference rate $279 a night by calling the Ritz-Carlton at 1-800-960-7082 and letting them know you are with David Horowitz's Texas Retreat. As part of the Texas Retreat, June 17-18, we will have a side trip to the George W. Bush Presidential Library and Museum on Wednesday afternoon, June 17th at 2:00 p.m. It will be a two hour tour and transportation from and back to the Ritz Carlton in Dallas included. This tour is provided at no extra cost to Texas Retreat attendees. • Special VIP event invitation for two - Register Now! • Special VIP event invitation for three - Register Now! • Complimentary admission for four to Texas Retreat events. • Recognition from podium during closing keynote banquet. • Special VIP event invitation for four - Register Now! The David Horowitz Freedom Center is a 501(c)(3) non-profit organization. Registration/sponsorship fees are partially tax-deductible using an IRS event formula.